Russian Subway Dogs is a bizarre game. Based on the real-world phenomenon of stray dogs mucking around in Russian subways, Spooky Squid Games’ newest release puts you in those dogs’ shoes, or should I say paws, with the goal of eating as much food as possible. Never before have I played a game like this, and I doubt I ever will again. And it is through that creativity and freshness that Russian Subway dogs succeeds, despite making a few missteps along the way. 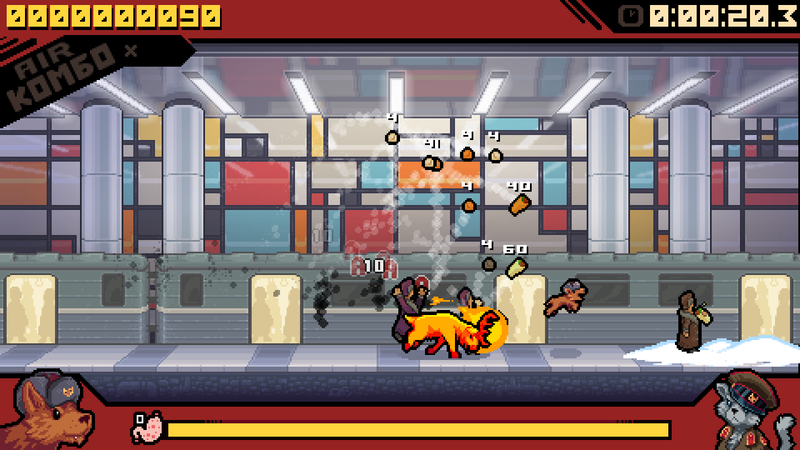 Russian Subway Dogs is a level-based, score-chaser that excels in short bursts. Each level sees you controlling a dog milling about on a subway platform, trying to scare Russian passersby into dropping their food, which you can then eat to keep your stomach full. To shock the food right out of their hands, you must maneuver your dog behind the unsuspecting sap and forcefully bark at them. Eating this dislodged food will give you points, as well as refill your stomach. In each scenario, you have to juggle said rumbling stomach, the targets on the platform, the depleting time limit, and the minimum score required to move on to the next stage full of Russians to heckle. The gameplay is incredibly frantic– demanding quick thinking and even faster reflexes. My use of the term juggle wasn’t a random turn of phrase either, as the highest scores can only be achieved by using your dog’s bark to combo food in the air, chaining together everything from vodka to shawarma. Really, Russian Subway Dogs is one part arcade-action, and another part volleyball game– and the sum of those parts is frantic fun. While that core gameplay is never expanded upon in any serious way, Russian Subway Dogs constantly keeps things fresh through its bizarre world. The game starts out simple enough, with Russians mulling around the subway with nothing more than a meal or a drink. As you get deeper into the game though, you’ll be faced with pigeons, poodles, bears, fishmongers, elk, and more, in conjunction with power-ups like coffee, hot sauce, and chocolate, which further keep gameplay interesting. None of these wrinkles totally change up the gameplay, but they do add a certain variety that kept me engaged from mission to mission. Bears and elk may seem out of place in a subway station on paper, but Russian Subway Dogs has such a zany presentation that everything including the kitchen sink fits right in. I mean, the cat narrator is named The Proletaricat– what more is there to say? Off-the-wall is the only way to describe this game’s atmosphere, and that really clicked with me. The combination of the zany personality and clean pixel art melds into something truly unique, and I can honestly say that there are few games I’ve appreciated more from a purely visual-perspective in 2018. Russian Subway Dogs does make two mistakes that do dilute some of the game’s appeal, though. Firstly, is the matter of unlockables. There are many different animals that you can unlock to play as. However, the differences are purely cosmetic. It would’ve been nice to see them all have different attributes, thus setting them apart. This would’ve been a relatively easy way to add even more variables to the gameplay, and simply feels like a missed opportunity. The game’s biggest issue, however, is in its progression. Each level of the campaign has a minimum score required to progress, as well as three side objectives to complete. As you get deeper into Russian Subway Dogs, the levels become quite challenging, and I had to attempt some scenarios two or three times before I could even meet the minimum score. That’s not necessarily a bad thing; games should push back on the player some. Without a steady difficulty curve, progression doesn’t feel rewarding. However, here in Russian Subway Dogs, in addition to needing a minimum score to beat each level, you won’t be able to move on to the next stage unless you also acquire a certain number of bones. Bones are rewarded for completing the side objectives, which more-or-less makes them mandatory. You don’t have to complete every side objective to unlock the next level, but you have to complete enough of them that simply moving to the next stage becomes a pain. A lot of these side challenges are actually quite tricky, and when you combine those with an already tough mission, progression can feel rather stunted. There were many times where I was spending ten to twenty minutes just trying to farm easy bones to move onto the next level, and that became frustrating. Bear in mind, that the typical stage lasts no m0re than a few minutes. These side-missions should’ve been extra hoops for players to jump through if they want more challenge, not an added prerequisite to players seeing everything the game has to offer. Having to stop after almost every stage to find more bones just really bogged down the game flow. If I were in charge, the bones would’ve been used to unlock bonus levels, not as a means to slow down the main campaign. You have to take the good with the bad in Russian Subway Dogs. The game excels in short bursts due to its unique arcade gameplay and zany presentation, but is held back from greatness by its progression and unlockables. Russian Subway Dogs is easy for me to recommend, but that recommendation isn’t without its caveats. I wouldn’t consider any of its flaws anywhere near game ruining; however they certainly dampened my enjoyment with the title, but not nearly enough to come away with anything short of a positive opinion. Russian Subway Dogs is an incredibly unique arcade-style title that excels in short bursts. With a wonderfully zany presentation and great mission diversity, there is little else like this game. Its score-chasing, shawarma-munching action is diluted somewhat by its stunted game flow and superfluous unlockables, but neither flaw results in Russian Subway Dogs being anything short of good.